The latest results from the Pellmyr Lab’s ongoing study of Joshua tree and its pollinators are online as part of the new October issue of Evolution. It’s the cover article, no less. The study, whose lead author is Chris Smith (now on the faculty at Willamette University) compares patterns in the population genetics of Joshua trees and the moths that pollinate them, and shows that although the moths have become two separate species, the trees may not have followed suit [PDF]. Female yucca moths carry pollen between Joshua tree flowers in special mouthparts. When she arrives at a new flower, the female moth lays her eggs inside it, then deliberately applies pollen to the flower’s receptive surface. When the fertilized flower develops into a fruit, the moth eggs hatch, and the larvae eat some of the seeds inside the fruit. Among the yuccas, Joshua trees are unique because they’re pollinated by two species of moths, which are each other’s closest evolutionary relative. 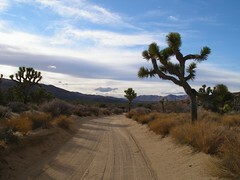 One species is found in the eastern part of Joshua tree’s range, the other in the west. Joshua trees from the east and west have differently-shaped flowers [PDF], which is consistent with the hypothesis that coevolution between moths and trees has driven both toward an evolutionary split. “Western” Joshua trees at Joshua Tree National Park. Photo by me. The new study goes deeper to look at genetic relationships between different populations of the moths and the trees, and what it finds isn’t as tidy as the earlier work might suggest: While Joshua trees’ morphology corresponds nicely to the split in the pollinators, the patterns visible in their chloroplast DNA does not. In some populations, trees look “eastern,” but have chloroplast DNA more closely related to “western” populations. This suggests that, although the moths have become separate species, they’re still moving between the two kinds of Joshua tree frequently enough that the trees haven’t quite split. Why do the two tree types look different, then? One possibility is coevolution with the two moth species, which might exert selection the trees in different ways. There’s still a lot of work to do before we fully understand what’s going on here. Will Godsoe, the other doctoral student in our lab, is doing some intensive niche modeling to see how much environmental differences might be contributing to the patterns we see here. My own dissertation will look at whether the same incongruities turn up in nuclear DNA, which can have a different evolutionary history than that in the chloroplast. This entry was posted in coevolution, evolution, my research, science and tagged Joshua tree, Research Blogging, speciation by jby. Bookmark the permalink. Hmm. Google “Joshua tree and American Naturalist”, and this is the top hit. Scary.